Most price action trading strategies revolve around price action patterns like Pin Bar, Inside Bar and Engulfing Pattern. As a result, many traders equate price action trading strategies with price action patterns. The truth is that price action patterns merely form a subset of price action trading strategies. For instance, a Pin Bar is simply a price pattern. A Pin Bar trading strategy must define the market condition for trading Pin Bars, the entry setup, and the exit method. Buying and selling every Pin Bar you see is a recipe for disaster. Price action trading strategies go beyond price patterns. A price action trading strategy must answer the following questions. How do we determine the market bias? What is our trading setup? How do we exit the trade? Market bias refers to the market’s tendency to move in a certain direction, either up and down. It is also known as the market trend or price action context. The market bias is what gives us our edge. It has a strong influence on the success of our trades, far more than any one, two or three-bar price pattern. To prove this point, we will look at how different patterns do within a given market context. We marked out the ID/NR4 patterns on the ES chart below. We also observed how Pin Bars performed in this market. This last chart marks out the two-bar reversals. For all three patterns, most of the bearish signals did well, and most of the bullish patterns failed. The last chart is extremely telling. Usually, traders would look out for two-bar reversals that have strong bars in both directions or for the second bar to reverse the first bar completely. However, for our example, we did not impose any more criteria to “enhance the pattern”. We simply marked all two-bar combinations with opposing direction (i.e. a bullish bar followed by a bearish bar, or a bearish bar followed by a bullish bar). As it turned out, this simple pattern did extremely well. The merit does not lie with the pattern. It lies with the bearish market bias. The point here is that once we get the market bias right, almost any pattern will produce results. There might be some whipsaws, but they are not fatal as long as our trade risk is under control. Hence, we should spend more time figuring out the market bias instead of searching constantly for price patterns. However, this is easier said than done. We selected the bullish market above by looking back in time. Any one can do that. The difficult part is in evaluating the market bias in real-time. In price action trading strategies, there are several simple but effective tools to help us decipher the market bias. Some price action trading strategies pay attention to price action in a higher time-frame as a way to find the bias in a lower time-frame. The market never moves in a straight line. It moves in wave-like market swings, creating swing highs and lows. Most price action trading strategies are sensitive to the market structure built by these swing pivot points. Higher highs and higher lows point up. Lower highs and lower lows point down. Upwards sloping trend lines track bullish markets, and downwards sloping trend line follow bearish markets. In price action trading strategies, a decisive break of trend lines signals the beginning of a new opposing trend. Our example strategy in a Template for a Simple Day Trading Strategy uses a trend line to define the market bias. In a bullish market, support levels are likely to hold up. In a bearish market, resistance areas tend to keep the market down. By paying attention to how the market reacts at major support and resistance areas, we can get a glimpse at the true bias of the market. Many price action trading strategies include volume analysis. Along the path of least resistance, the market should move with increasing volume. On the other hand, when it is moving against the market bias, volume tends to dry up. Hence, when implementing price action trading strategies, traders should use these tools and integrate their observations to find out which direction is the market is more likely to head in. This is the first step in all price action trading strategies. The importance of market bias also underlies the rise of global macro trading and trend following strategies. While the former uses fundamental data and the latter employs technical methods, both strategies seek to align themselves with the market bias, without over-emphasizing the exact timing of their entries. A trading setup is a specific set of market circumstances we want to see before we consider a trade. In price action trading strategies, it involves a price pattern. 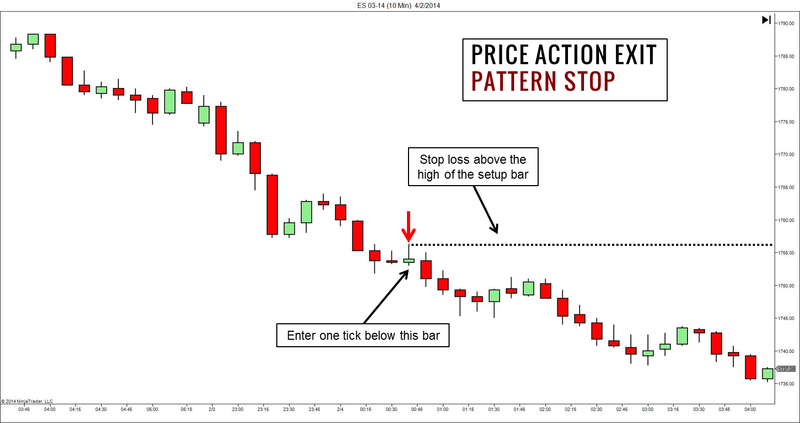 Examples of short-term price patterns include an inside bar, reversal bar, or any candlestick pattern like Engulfing or Morning Star. Some price action trading setups focus on longer term chart patterns like Head and Shoulders and Double Top. Didn’t we just argue that the market bias provides us with the trading edge? Then why can’t we just figure out the market bias and jump right into the market? Why do we need a trading setup? In theory, we can simply enter a trading position once we form our opinion on the market bias. Once we change our bias, we exit and reverse the position. However, this way of trading demands deep pockets. This is because the adverse price change between the time we enter, and the time we realize that our market bias has changed, can be huge. Since retail traders do not have deep pockets (if you do, you are an institutional trader), we need to control our risk with little pockets of money each time. This leads us into the purpose of a trading setup, which is risk control. By timing our entries with a setup, we are able to pinpoint a stop-loss point in our price action trading strategies. This is especially true for price action trading setups which have a natural and logical pattern stop point. This is usually the lowest point of a bullish pattern or the highest point of a bearish pattern. This chart shows the natural stop-loss level of a bearish Pin Bar pattern. There are several ways to exit a trade. In price action trading strategies, as mentioned above, our stop-loss depends on our entry setup. As for setting targets, there are two common price-based methods. Support and resistance levels provide logical points for exiting. 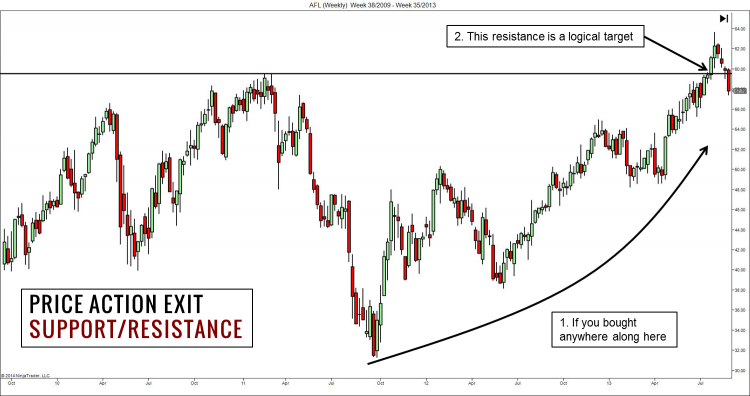 For a long position, the nearest resistance level is the highest probability target. For a short position, the closest support level is the highest probability target. If we aim for levels that are further away from the market, we need to accept a lower chance of the market hitting our target and some pullbacks along the way. What if the market is breaking new ground? It is moving into price ranges that it has not been to recently. In such cases, the measured move concept is useful for projecting targets. The measured move takes the length of a previous impulse swing and project it by the same amount. It is a specific instance of Fibonacci extension using 100% for the projection. Using a smaller percentage gives more conservative targets. For best results, base your projection on a strong and clear impulse wave. Ultimately, trading boils down to finding a method that is suitable for your skills and temperament. Hence, instead of blindly following price action trading strategies of (purportedly) successful traders, learn from them what makes sense to you. Focus on picking up methods and knowledge that answer the three questions revolving around price action trading strategies. Then, combine them to create complete price action trading strategies that tick for you. Remember that price action trading strategies go way beyond just price patterns. Great post it took me three years to develop a strategy unique to myself. It was well worth the wait. Thanks for your comment. I agree! Well worth the time and effort. Wow what a mind blowing post i never thought that trading can be so simple when applying price action patterns . Infect i never understood how price action now i do all thanks to you . Please keep the good work up. Just wanna ask one thing . What is a tick in the market what does it mean? Glad you like it! A tick refers to the smallest possible movement in the market. You can read this for more details. I prefer to use heiken ashi candles to ordinary ones, and use them with Bollinger bands to determine trend change, together with the bollinger squeeze indicator super stoch and the Hull direction indicator. I use the ATR to determine a reasonable stop loss at the time frame that Im trading. Im in the Apiary fund program, gold 1 level, and the present fund record shows 70 trades for 15 losses and reasonable overall profit. I dont know if its statistically significant. These trades are spread over a month or so, ie a couple or so trades a day, generally four hour chart. I reckon that a reasonable beginning approach is to set up one or two indicators and spend a lot of time interpreting what they mean, then add another, see if it helps, if it does, leave it in the mix. The multitrend indicator is enormously useful as you can see overall trend at a glance and from any time frame. I think its something that might be in our ancestral programming, its very similar to looking at the tracks of an animal and determining which way it went, how fast, and how long ago, so in forex we are hunting. And we have rather the same rules guiding us: a Cheetah can make five pursuits for a kill, beyond that it doesnt have enough energy reserves to try again! Thanks for the detailed sharing. Nice analogy to hunting! All the best to you. Hi Ephraim, not rushing through any steps is the right way to go about this. Without knowing more about the trading approach you used during the six months screen time and your experience with it, it’s hard to offer more specific advice. You can email me on this page with more details and I’ll try my best to help. 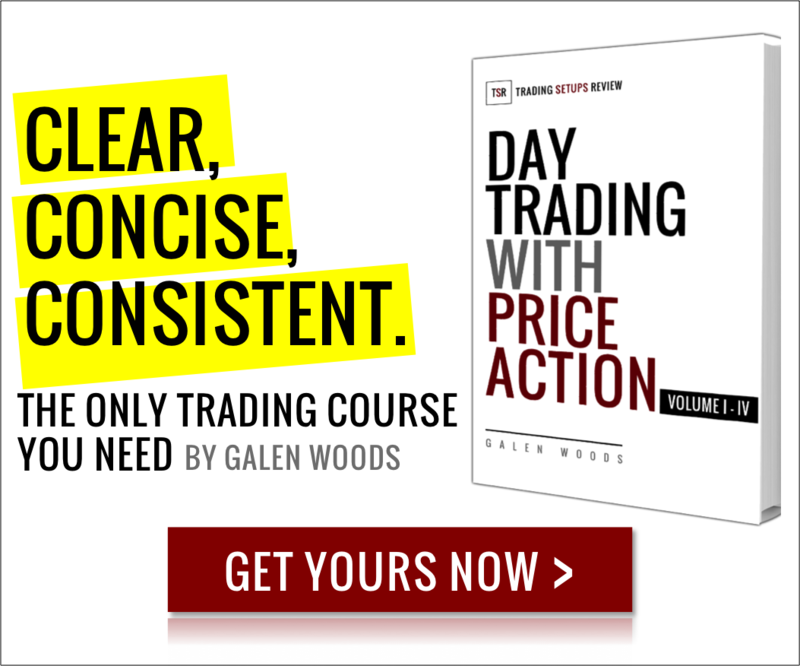 Is your entire book and all strategies devoted to day trading? Is there anything there that a swing trader can use? Hi! 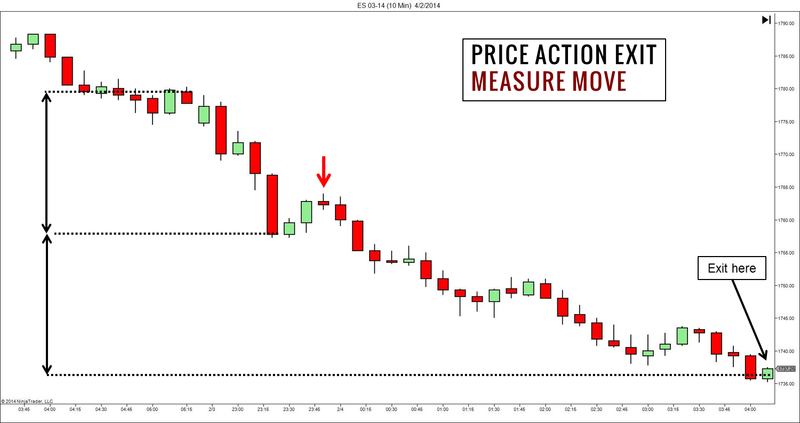 If you’re referring to the books in Day Trading With Price Action, it is geared towards day trading in the sense that all the examples are drawn from day trading time frames. That said, most of the course concepts are valid regardless of the time-frame and hence be used for swing trading. However, there are still important differences, especially when it comes to interpreting the price patterns with gaps and the placement of stop-losses. Experienced swing traders should have no problem adapting the framework for swing trading, but beginners might find that challenging. For more information, you can refer to this Course FAQ and the reviews here.